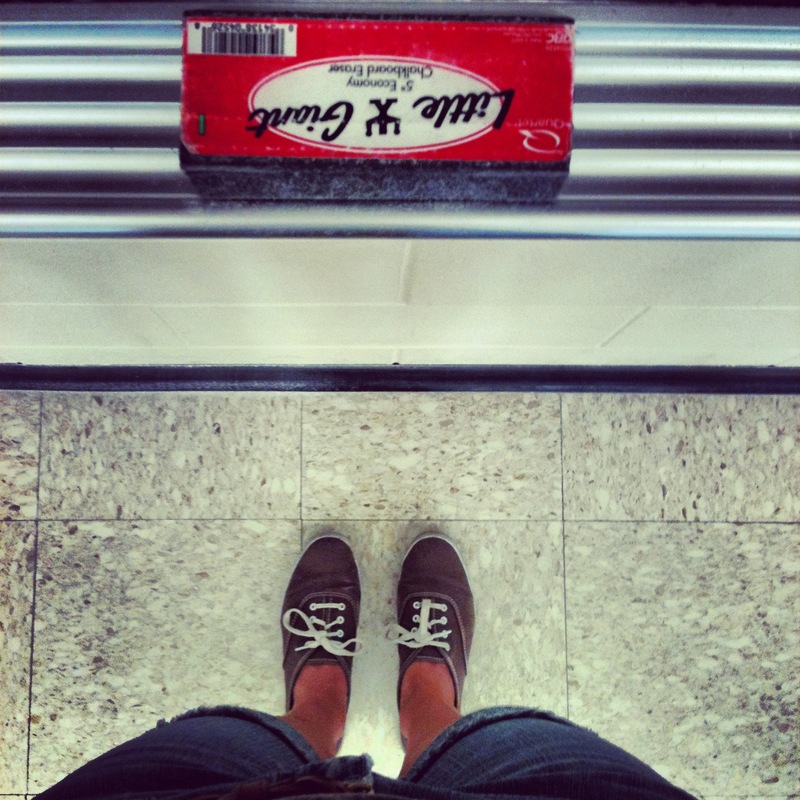 You’ll notice I haven’t blogged in a month and a half….my head’s been all over the place. In that time, I have: 1) Sadly moved from lovely Lawrence, KS 2) Applied and interviewed for jobs 3) Accepted a job 4) tried to see friends as much as possible 5) packed and threw stuff away and packed some more. 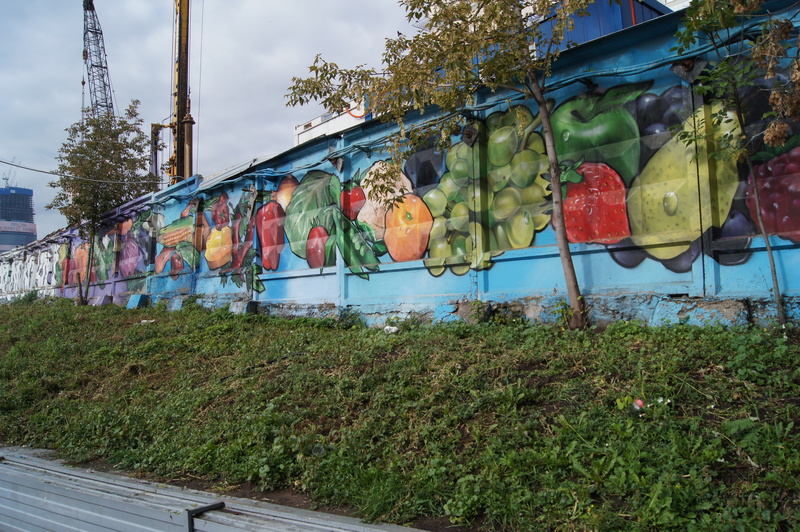 The reason I’m at my parents’ house, and not in a new apartment in a new city looking for a new community garden, is because I’m moving to Moscow, Russia. A lot of you probably already know this from all the crazy social media. Or from talking with me in person, which still happens sometimes. My job doesn’t start until September 1, and I thought that instead of rushing from Lawrence to like, the other side of the world, it might be good to spend a few weeks with my family. I’m keeping the things I didn’t sell/donate but am not taking to Moscow here. So, I’ve been going through childhood/ middle school/high school/college stuff and throwing it away to make room for the stuff I’ll probably decide to throw away in three years. Remembering your middle school self is humbling, but fun. My family and I also made a traditional/sentimental family trip to Disney World, where it’s surprisingly easy to act like a child at 25, especially when you’re moving to Russia and your parents want you to just have the best. time. ever. 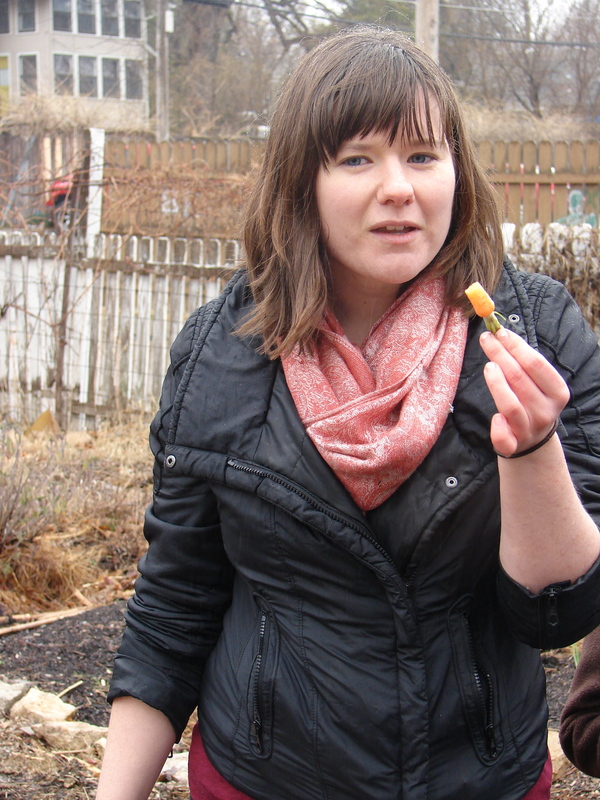 It saddens me to write this, but the last few weeks in the community garden were less sentimental than I’d expected. The weather was in the 100s every single day for almost two weeks. 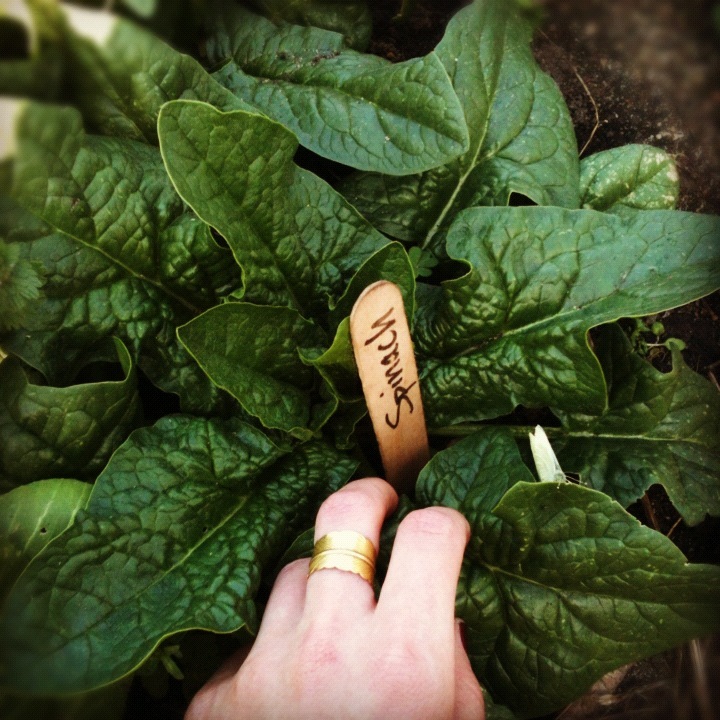 Though I still watered and weeded and picked the Swiss chard and malabar spinach that could survive the heat, it was hard to be in the garden–or anywhere besides a swimming pool–for more than fifteen or twenty minutes. My friend Nic said every time he saw my plot, he remembered that I really was leaving; I’m embarrassed by how void of green it was. A huge gesture of goodbye didn’t feel necessary; I’d been saying goodbye all summer. And so, after we packed up my things and I checked out of my apartment, I stopped by the garden and took one last photo. And that was it. But now that I’m gone, a grand (but manageable/readable) summing up seems appropriate. So, “The Best of the LCGP in Chronological Order, as Selected and Narrated by Kara Bollinger” is on its way. More soon about my new job and what will become of the blog, too. the time we almost lost the community garden. Writers need to catch readers’ attention. Additionally, as a nonfiction writer, I am compelled to tell the truth. 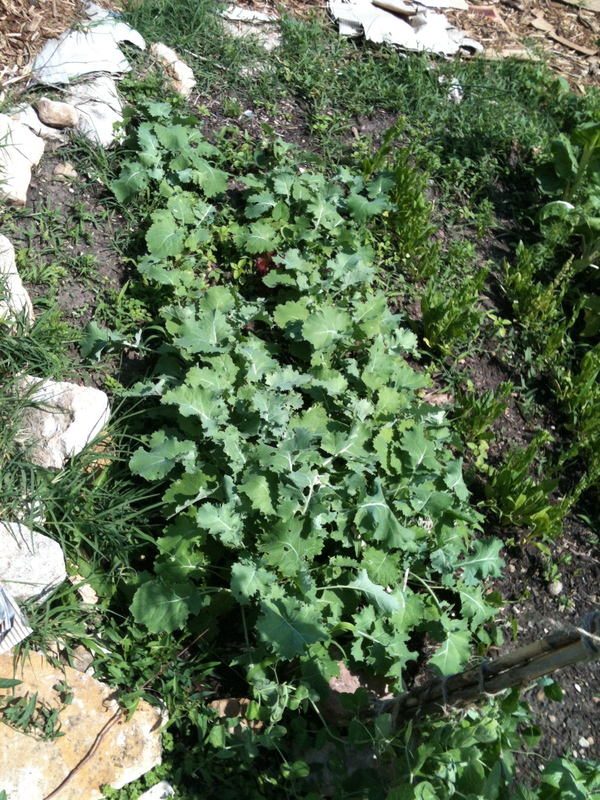 I assume that the title of the blog entry caught your attention–can you imagine me functioning without the community garden? The title is not only eye-catching, but also true. For a moment in time last week, I seriously believed that we may lose the garden. Our story: We (the other community gardeners and I) received a bizarre email from a guy claiming he owned the land where the community garden is, and that the city threatened to take the land away from him. He said he didn’t want to do this, but that we needed to contact him within 24 hours so he could help. Also, the email was sent from a Kansas City business–a pawn shop. I was confused. 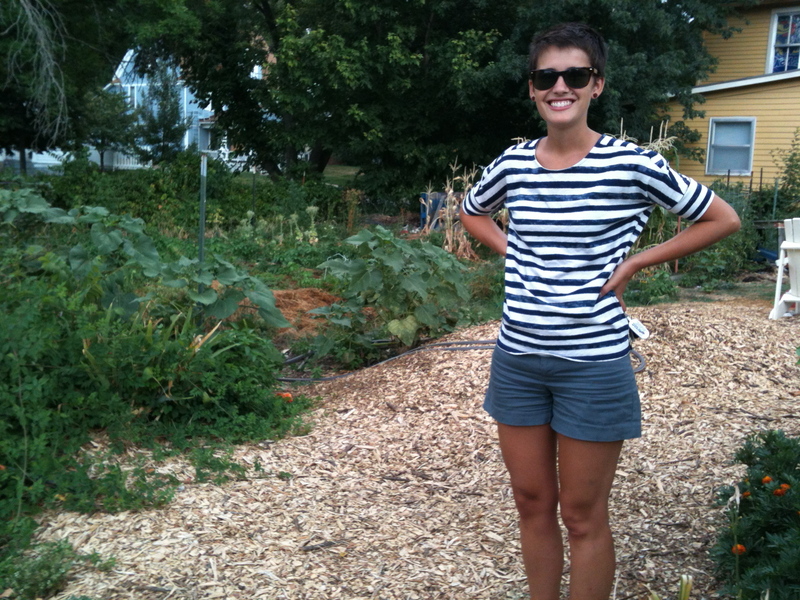 You’ll remember that two men who live in Kansas City own the land the community garden is on. You’ll also remember that last fall, I met one of the men who owns the land. I thought they were both lawyers, so the fact that a pawn shop owner was contacting us was sketchy. The email was also super vague, most specifically in that it gave no reason for the city taking the garden away. I envisioned those scam phone calls from foreign countries asking for money or bank accounts or credit cards, though I wasn’t sure how they were going to scam us by threatening to get rid of the garden. Despite my skepticism about the email’s validity, I imagined the rest of Lawrence summer sans garden. And then I stopped; I hated it. Naturally, this email set off a chain of emails about what to do. Some thought it was a scam, some seemed legitimately worried, and others mocked pawn shop guy’s grammar (surprisingly, English teacher Kara was not one of those people). Superhero Michael (no, for real, if you met him you’d agree) called the pawn shop. The real story: Pawn shop guy is, in fact, co-owner of the land. Apparently, the City of Lawrence drove by the garden one day last month. We hadn’t mowed a tiny patch of grass between the sidewalk and the street. “Nevermind the undergrad neighborhoods filled with post-graduation and summer-celebration PBR cans and red Solo cups,” they must’ve said, “We’ve gotta get this community garden cleaned up.”So, they sent the owners’ lawyer a letter requesting that we mow the area. If we didn’t mow the grass within a specified time frame, we would be fined. By the time the owner got the letter from his lawyer, the time frame was almost up (hence the 24-hour business). Apparently the man who owns the pawn shop is an older guy and not super great with email/etc, so he kind of freaked out (hence the vague, rushed email). Superhero Michael biked to City Hall. They said it was no longer an issue. They’d gone by the garden the next week, and since it had been mowed (because we mow the grass), took it off “the list.” However, if we forget to mow again, we’ll be fined. My analysis (rant): The city’s scolding/threat annoyed me. It’s The Man, man. 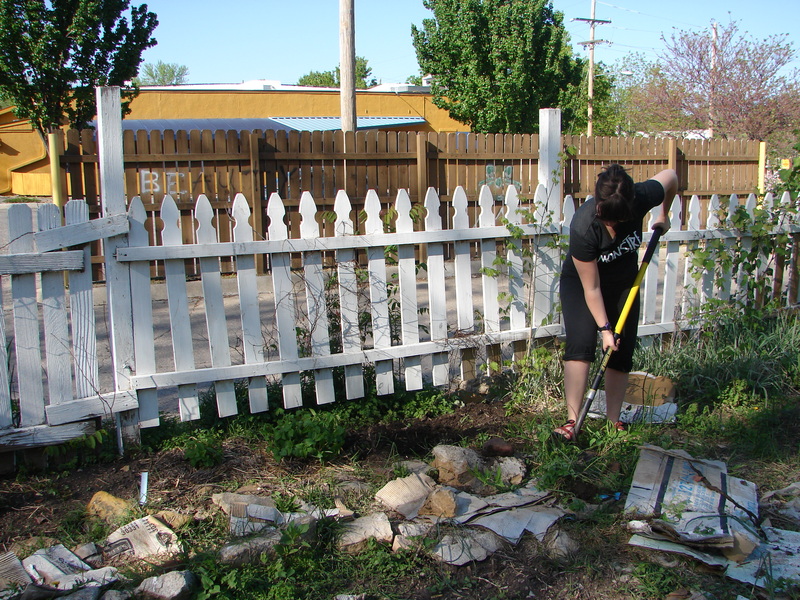 We work tirelessly to restore and maintain an entire lot in Lawrence. And frankly, we do a pretty good job. 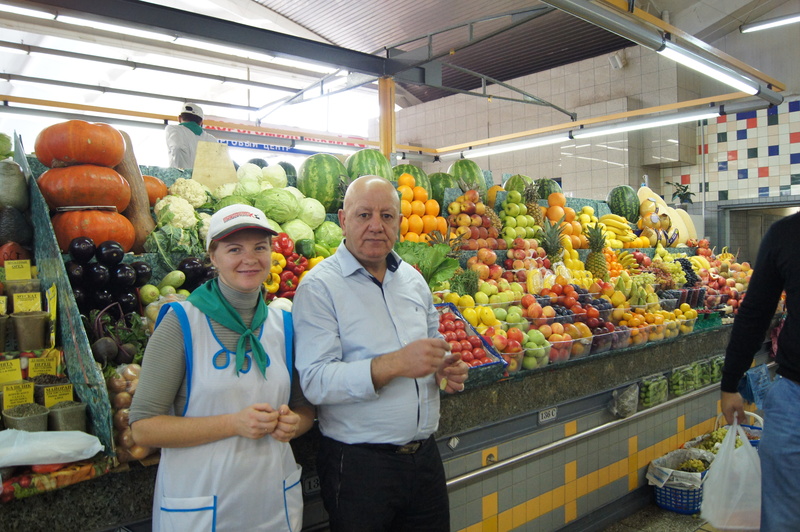 It’s beautiful and produces a lot of food. People who live in the neighborhood often stop by and comment on the work we do. Yes, occasionally things get overgrown, but there are worse looking lots in Lawrence, lots that “deserve” to be scolded. If we were a sports team or a fraternity, it would be fine. *Wincing at my own blatant bias* I know that some of you will shake your heads like a parent/grandparent and say “Well, rules are rules,” but I don’t like this rule. Aside from that debacle, things are going swimmingly in the garden. There’s a bit of summer-time planting to do. And lotsa weeding. 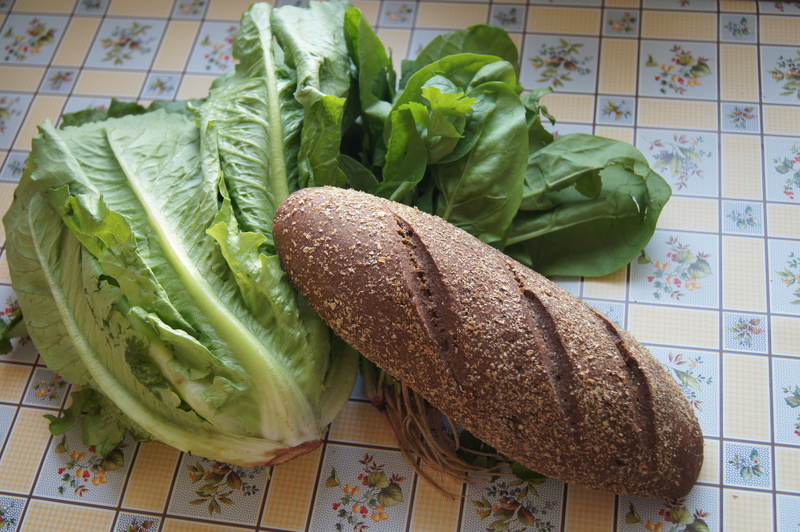 And even more harvesting, cooking, eating, and giving food to friends. The garden feels more manageable now than it did a few weeks ago, too, because we’ve spent some time cleaning things up, drying herbs and tea for later, re-mulching the pathways, and throwing things away that are done (mostly bolted spinach and lettuce). 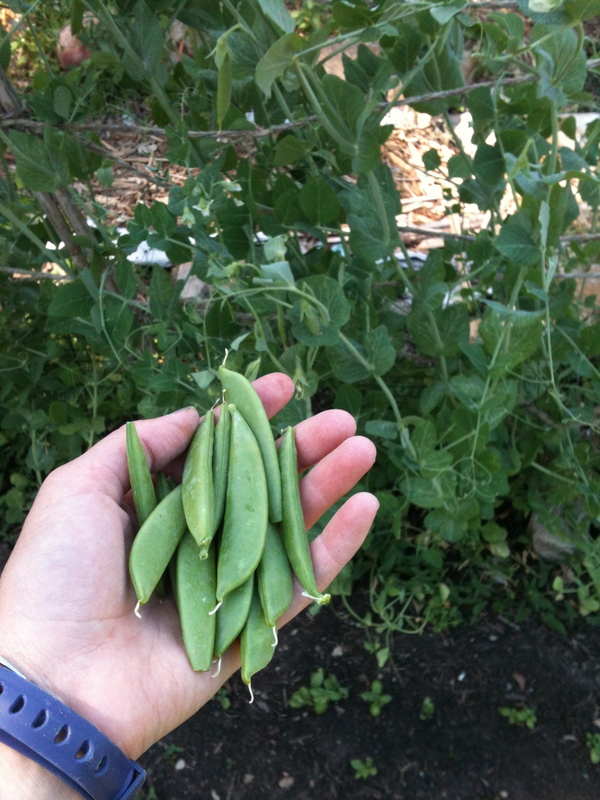 Perhaps my most important plant related news is that I am in love with peas. IN LOVE. LOVE! It’s officially official. They are doing so well this year. The offer still stands: if you’d like food, let me know. 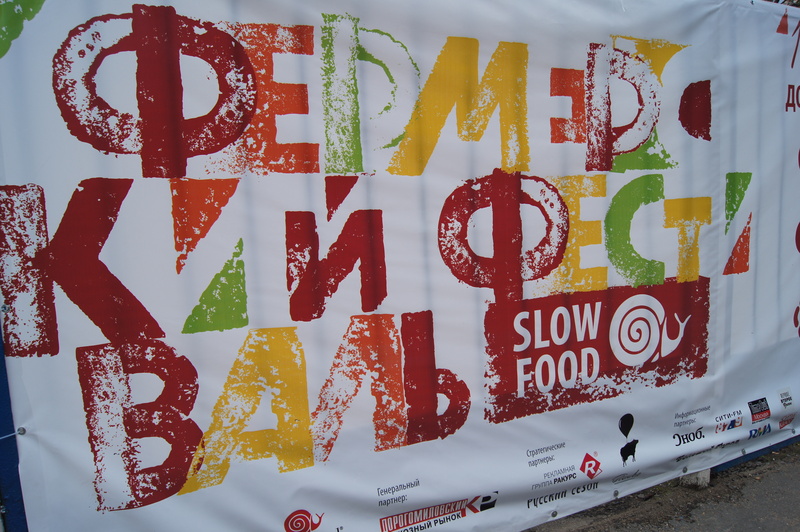 Those who have visited to pick food haven’t been disappointed. Support the rebellious, countercultural community gardeners. Down with The Man.Huzzah. summertime may. and an invitation. Monday Morning is a great Fleetwood Mac song. Monday morning is also when I pick up student essays. I will grade them as quickly as possible. I will submit grades. I will graduate next Sunday, one week from today. I have to be ready for graduation at 7:10 am. I’m serious about that. And then, I’ll be all finished with KU. Spending as much time as possible with these two heartthrobs. 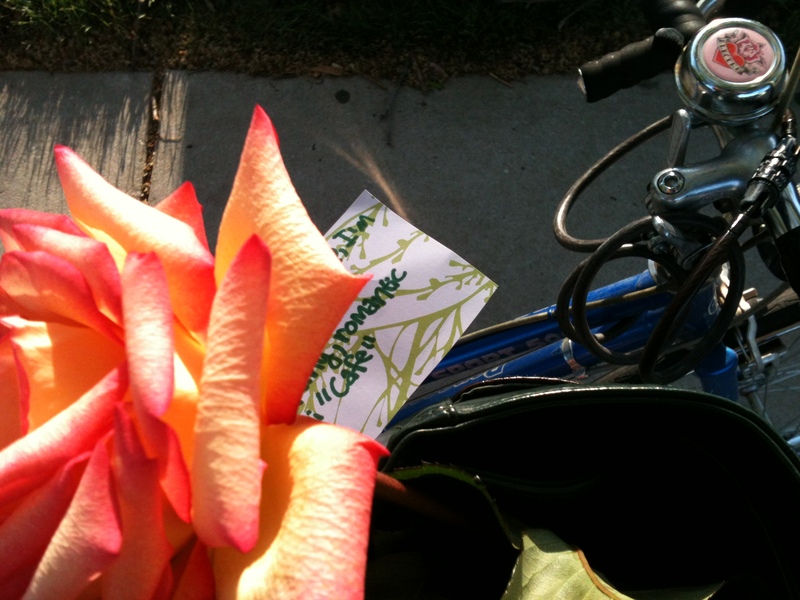 Bike-delivering a rose and a clue to help my friends of seven years get engaged. 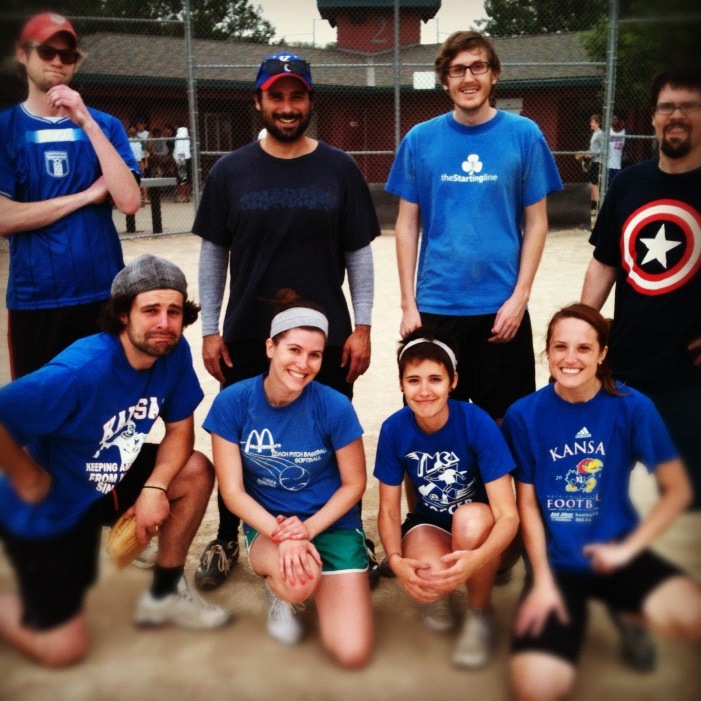 Going 0-4 with this killer softball team. Teaching in jorts. 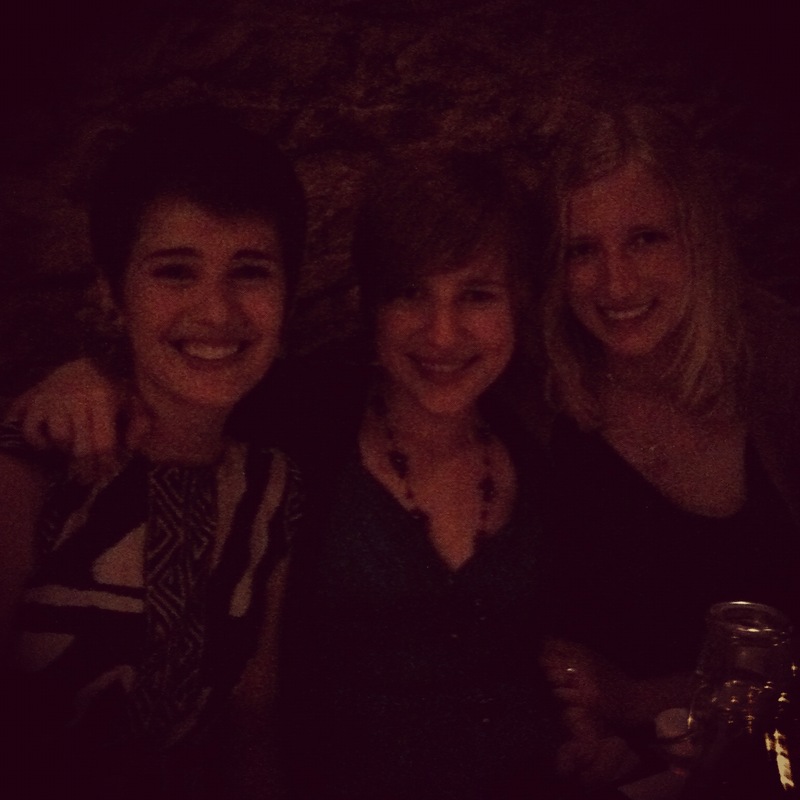 And Instagramming it. 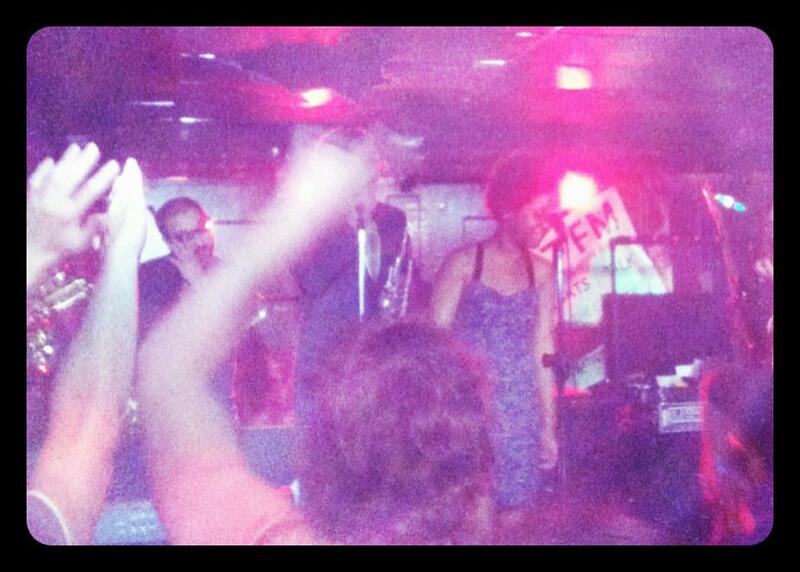 Attending soul concerts with the Communication Studies kids. 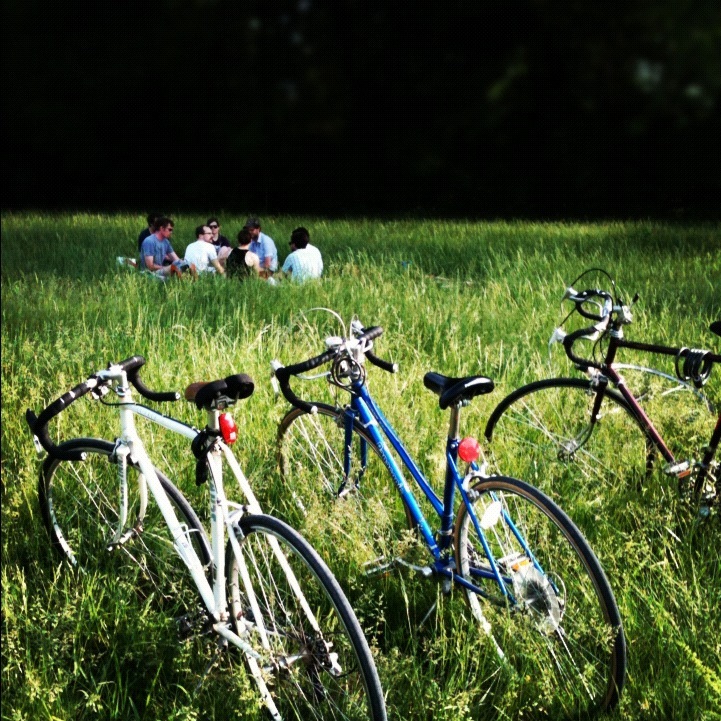 Biking, picnicing, blanketing in general. Phil’s birthday party might be my favorite ever. Basically, summertime May is where it’s at. In addition to free time, summertime May is a result of not knowing when I’m leaving Lawrence. Depending on what job I get (when I get a job), I have no idea when I’ll be moving. June? July? Eh? Lawrence summers are my favorite so I’m starting early to ensure that get to have one. Occasionally I get sudden feelings of guilt. I’m too used to working a lot. Grad school makes a person sort of robotic, but I think I’m slowly getting over it. The garden also looks like summer already. I’m not sure how it’s been in your part of the planet, but here it’s been hot. 90 degrees every day this weekend. And rainy some days, too. This makes the garden busy. The pea plants are really taking off. 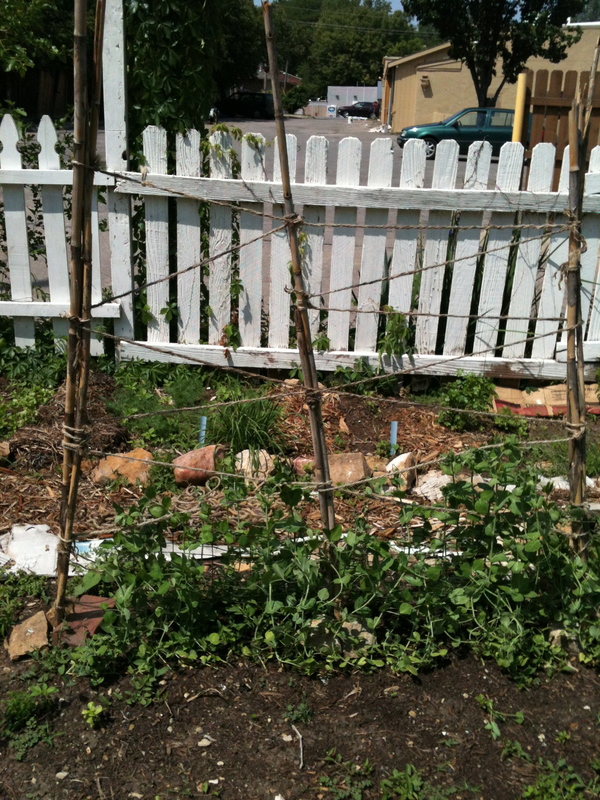 This weekend, I realized this and extended the trellis. It’s a little lopsided but totally functional. I hope my garden is always makeshift. The kale is also currently crazy, so I harvested a not literal ton to thin it out. Then I thought I had probably lost enough fluid from sweating for one afternoon and went home to lay on the couch. Summertime may also has garden downsides. First, something weird happened in my plot. 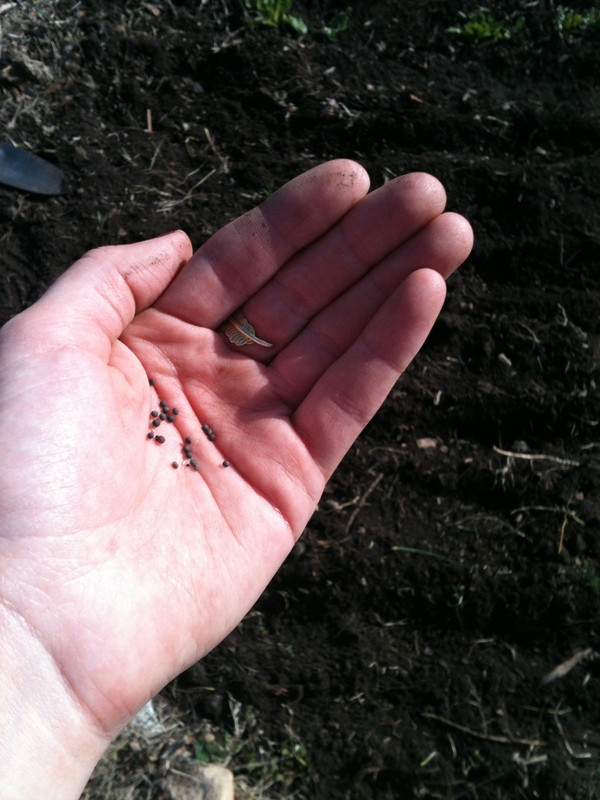 When plants get done growing/producing (or if you aren’t diligent enough about harvesting them), they will “go to seed.” You can let the seed dry and plant it later, which is cool. The spinach Clare and I planted never got big enough to eat, but has already gone to seed. I’ve never seen this happen before. I assume that it’s because it got so hot so quickly. This week I’m going to trim the plant off and let it start over, but that’s just a last ditch effort. We might be spinach-less. Also, the garden is on its way to getting outta control, so I have a proposition for all you blog-readers. 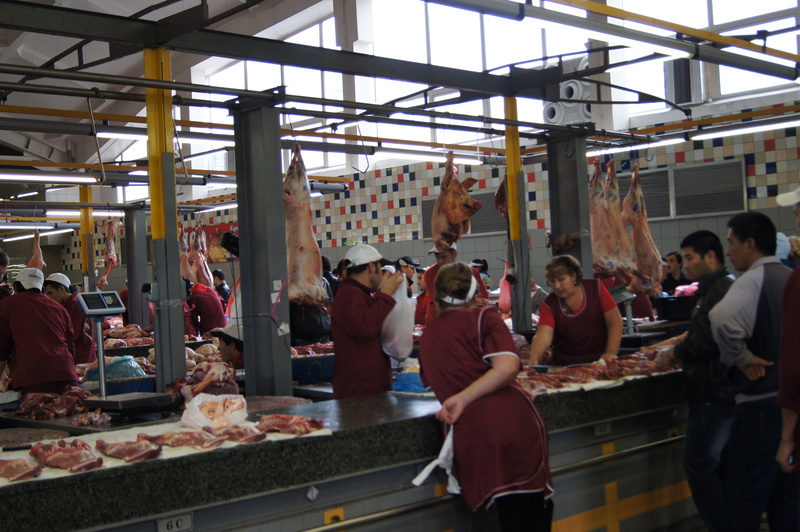 Having a food surplus isn’t a bad thing, but it kills me to see things go to waste. Recently my friend Nic was working in the garden working and a visiting track team walked by and asked if he knew where they could get some food. He pointed downtown and then laughed to himself. They were oblivious to the quasi-ridiculous question they had just asked him. I want people to eat our food because it is good. I also secretly hope that you’ll fall in love with the garden and want to garden, too. But somehow I think you already know that. I plan on harvesting and donating some this week, but if you are in the Lawrence area and you want food, tell me. I’m serious. I will take you to the garden and we will pick any and all of these things: lettuce, lettuce, lettuce, lettuce, kale, swiss chard, chamomile, oregano, mint, sage, onions. Take me up on this. I’ll probably be there anyway. If you don’t, I will just bring food to you without you requesting it. Ask around; it’s already happening. Phil got bok choi for his birthday. Speaking of things getting away from us, these two sisters planted that carrot. They didn’t pull it up until today. Their complete shock/surprise was quite hilarious. Another happy Sunday afternoon. master of mulch, trellises, and english. Kara Bollinger, M.A. writing you directly from the bright, lovely state of Kansas. I defended my thesis with zero hang ups. I didn’t even need the nerf gun I had stashed under the table. After writing my thesis for two semesters, I’m able to intelligently talk about it to a group of professors. Hells bells, imagine that. After spending Tuesday defending and celebrating, I did garden things Wednesday, Thursday, Friday, and Sunday. If this surprises you, well…um…that’s weird. Four days of work means there’s a lot to tell you. But mostly photos. Wednesday I discovered I was tired. Sometimes I finish something major, and then I crash. Or get sick over Thanksgiving break because it’s the only time I have time to be sick. I think this happens to most people. Anyway, I realized this on Wednesday, my busiest-on-campus-all-day-long-no-breaks day. I didn’t want to build a pea trellis that day, but garden mate Clare and I had already decided we would. Building stuff in the community garden is a fun puzzle where you find whatever scraps are around and then create something out of it. It hasn’t not worked yet. Clare already had a general plan of how we should build the trellis. And after a bit of brainstorming, we had one. Again, like last year’s trellis friend Justin help me build, it’s very One Hundred Acre Woodsy. I love it. It’s not that tall yet, but in a few weeks when I’m antsy with free time, I’ll add to it. I also took some photos of things growing, because they are my favorite before they grow up. Though the day was hectic and I still had a softball game to play that night at 10 pm(woah! ), I felt so much better when I left the garden, as I always do. Much like the compost in the fall, the city of Lawrence sells mulch in the spring, so on Thursday garden pal Nic and I went and got a truck bed full. I don’t have much to tell you about this except that 1) getting mulch has been my personal goal all spring because the weeds around my plot are getting real crazy 2) it sorta sprinkled the whole time which gave the whole loading/unloading mulch thing a new level of intensity and 3) I really enjoy doing things that oppose gendered norms (ie girls aren’t supposed to be good at unloading mulch). Take that masculinity/femininity. On Sunday, I worked in the garden for almost 2 full hours. *Sings “Glorious” in high pitched annoying voice* I invited my students to come to the garden. We’re reading Michael Pollan’s The Omnivore’s Dilemma. 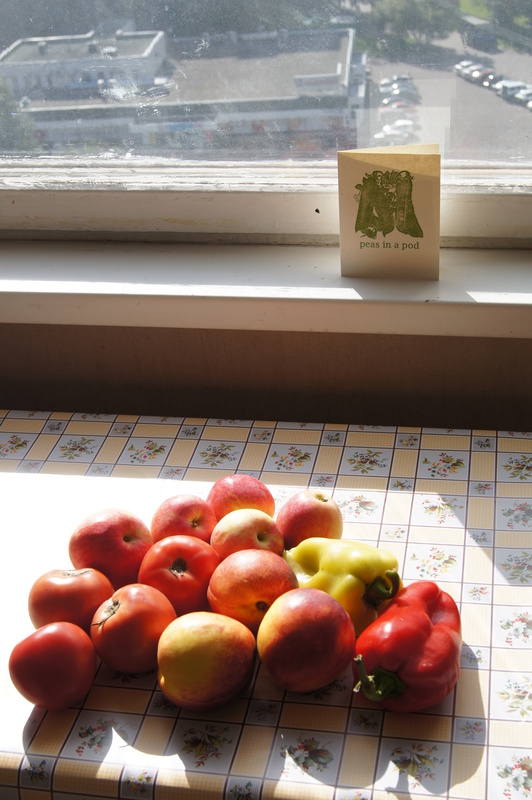 It’s also at the point in the semester where they decide they really need extra credit, so…I offered them a few extra credit options related to the book, one of which was coming to the garden and writing about it. 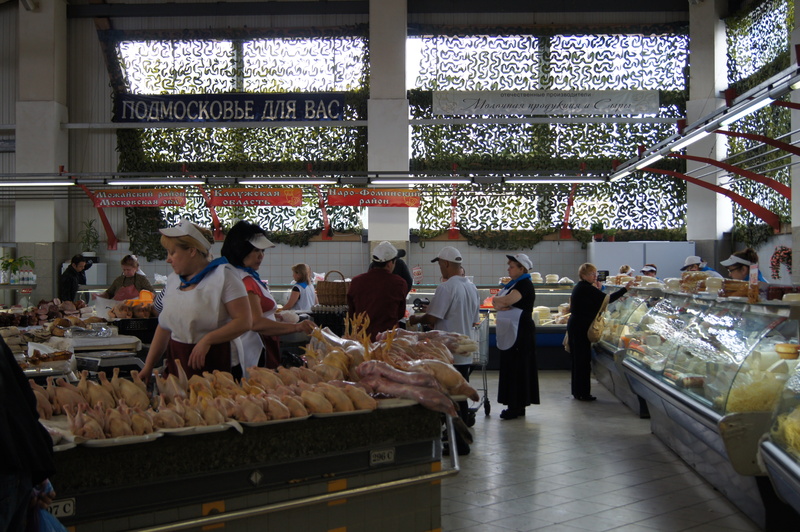 Another option is to write about the Farmer’s Market. 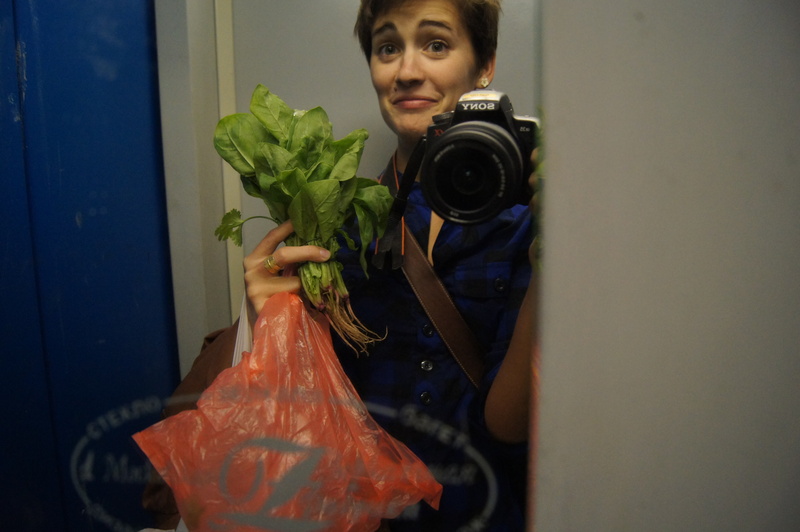 This morning one of my students asked if I knew how to cook swiss chard; he bought some at the market. After I spouted off a number of spices he could use and what he should serve with it, he said “Oh. So you definitely know how to cook it.” Best teaching moment of the day. I know I’m supposed to teach them English and not how to garden or eat locally, but can’t I do both? Though I had six or seven students excitedly tell me they were going to come to the garden, no one showed up initially! I was a little bummed, but then…when we were almost done working, one student showed up. Faith in humanity restored. 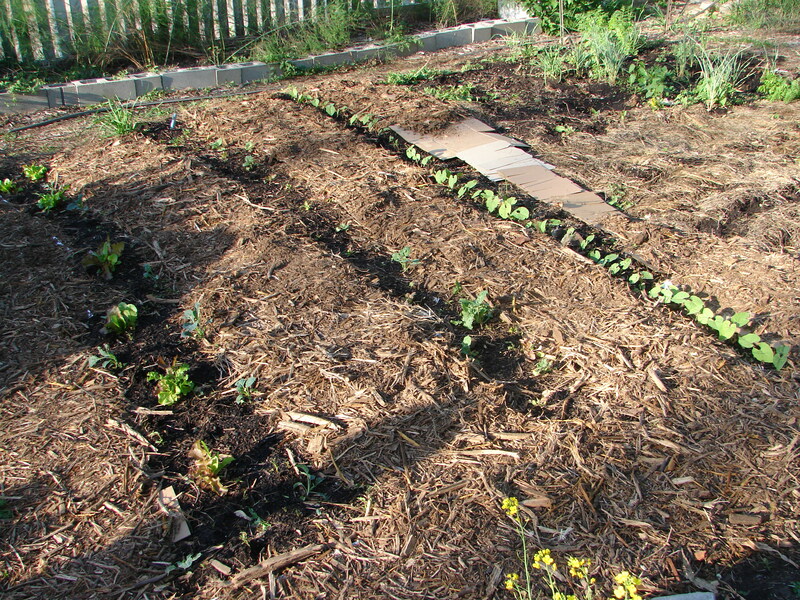 We planted okra, popping corn, and put down a bunch of mulch to keep the weeds out. Today I told my students that I cried myself to sleep in a bed of spinach because of the low turn out…and they thought that was hilarious. The crying thing isn’t true, though. I’ve never cried in a bed of spinach. Sunday evening garden time makes me feel sunny and smiley and worn out and like it was all worth it. It might be my favorite of the week. Our attempt to be at the garden at the same time at least once a week is working out well. There were eight of us there, and not only did we get a lot done, but we also got to chat/brainstorm/laugh/smile. There were also salted caramel cookies. The last blog post was a downer. Honest and real, but a downer. This post is going to be ultra-uplifting. Plus, yesterday, my dad asked if I had a back up plan if I didn’t get a job (thanks for the vote of confidence, Jeff!). Sure don’t! Maybe I don’t have to say goodbye to the garden. I can move into the shed, sleep in a wheel barrow. We had an emergency garden meeting last week. We sent super serious emails, chose a meeting time, and then at the meeting, laughed and smiled a lot and talked about ambitious things to do in the garden. So…not an emergency. But necessary. Bottom line: we need more organization. When a newer member asked if things were always this relaxed, I realized they weren’t. After some reflection, we decided that things had changed for a number of reasons. 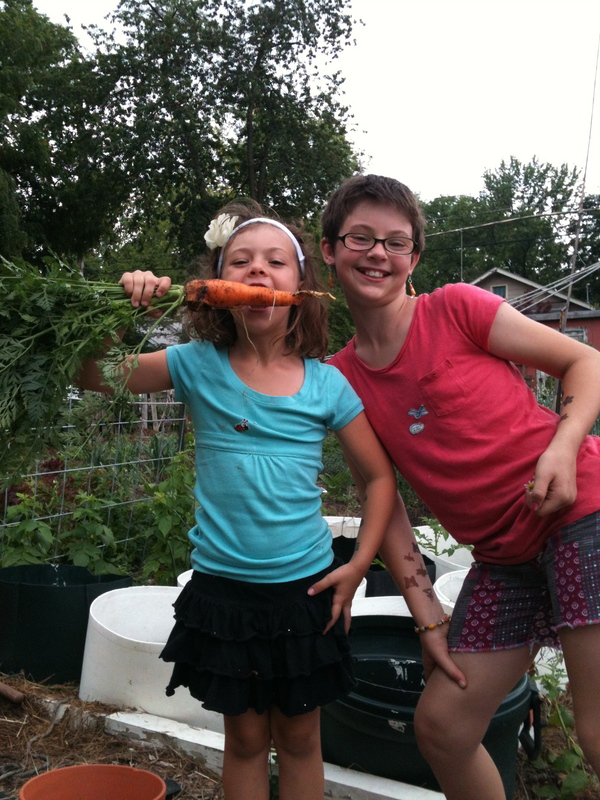 First, my first year in the garden, we had: 1) a bossy person 2) a girl whose occupation was “community organizer” 3) a stellar group of middle schoolers who volunteered every week and pulled a ton of weeds and turned a lot of compost. None of these people are part of the garden anymore. 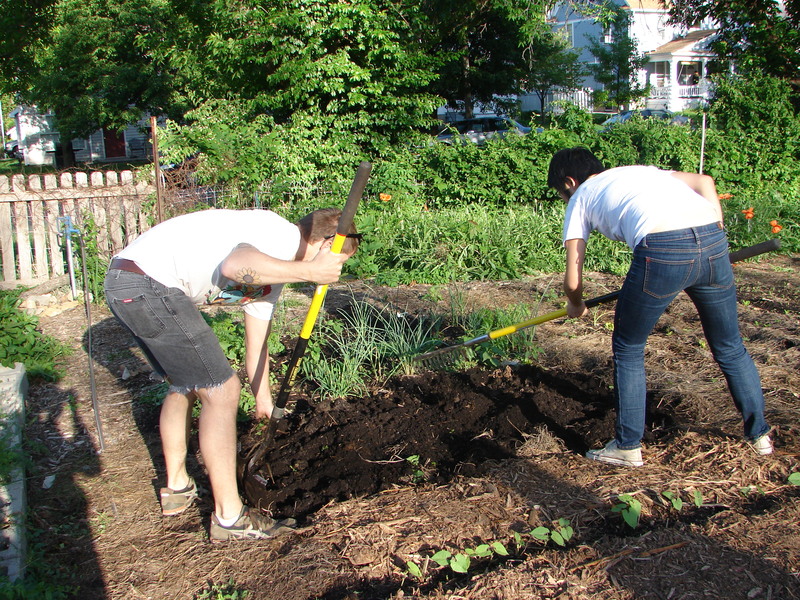 Second, the number of community gardeners decreased in the last two years. So, we’re taking care of as much space and attempting as many things as before, but with fewer people. Finally, those of us who are gardening are there at different times and don’t see each other often. It’s hard to know what needs to be done. And it feels so solitary. This garden is wonderful and shouldn’t feel solitary, nor should it be weedy, so we made changes. We changed our meeting time to accommodate more gardeners (5 pm on Sunday nights, you Lawrencians who have a hankering to garden). We made a list of tasks. We chose a treasurer. We sent a detailed email with our new ideas/plans/lists. 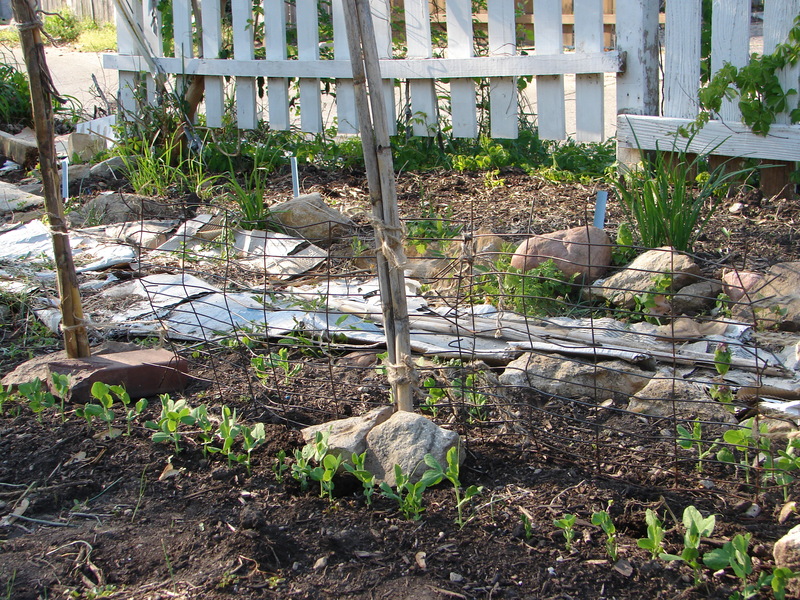 So, I might be projecting a little bit here, but stick with me: my thesis is about community work and writing, so I can’t help but consider the community garden in the context of that. I see strikingly similar complications/difficulties between my thesis and the community garden: the importance of communication, shared goals, reciprocity, collaboration. Maybe it’s like when you buy a new car and then you see that car everywhere you go, but I think the connections are there. Or maybe my thesis is just about something I care about/believe in, so it’s connected to my other interests/hobbies. This is not an indication of failure. This is the nature of community work. It is fluid, changing, ongoing. You are always clearing out weeds, re-planning and re-planting the same space, and working out the kinks because there are always weeds, seeds, and kinks. Any time one piece leaves or is added or changes, everything shifts. I’m also interested in researching why some people choose community gardens over their own private gardens. Another blog post. Or a book. Though we worked for an hour, we didn’t uncover much space. 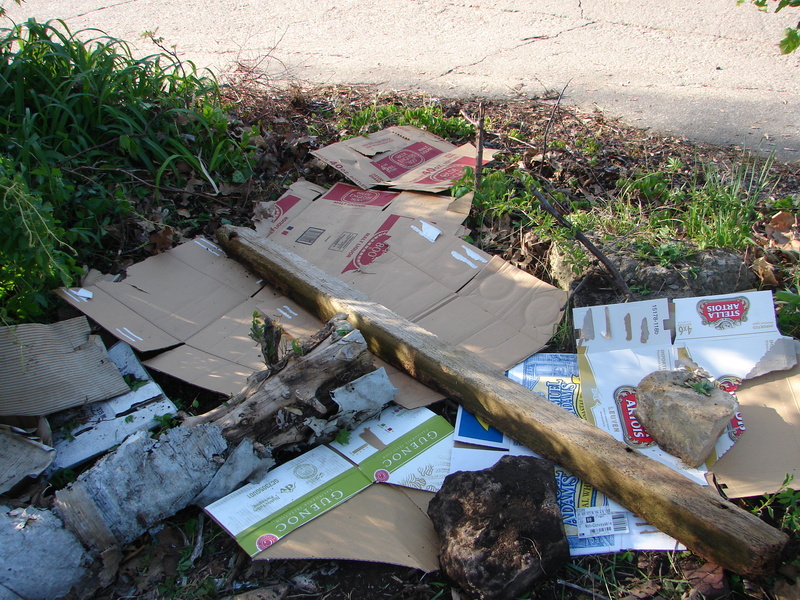 But, we put cardboard over it so the weeds/vines/trees won’t grow back. A work in progress. We also practiced better communication. 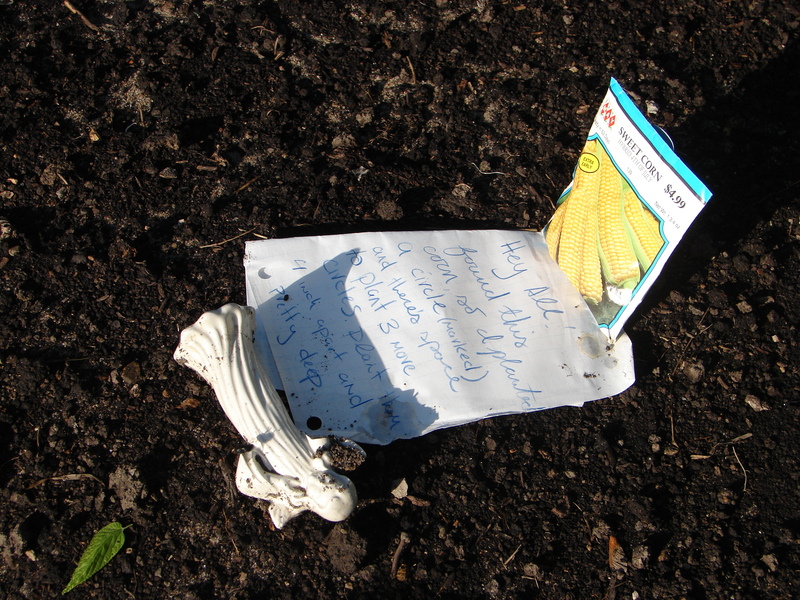 Garden friend Michael left us this note about planting corn. Handwritten notes held down by porcelain angels always trump emails. And our plan for overlap worked; Clare, Huan, and I were leaving the garden right as other gardeners arrived, so we could tell them what we’d done. We also smiled/laughed. Next order of business is more garden watch parties and potlucks and celebrations. First occasion of celebration: This Tuesday (2 days! ), I defend my thesis at 9 am. At 11 am, you’ll (hopefully) be able to call me Master Bollinger. If you want to buy me lunch or a drink or an ice cream cone or if you just want to talk to me or watch a movie or call to say “You’re the greatest/smartest/best!” or make a music video or play catch, hit me up. “Having a drink at the Pig” are as concrete as my plans have gotten. 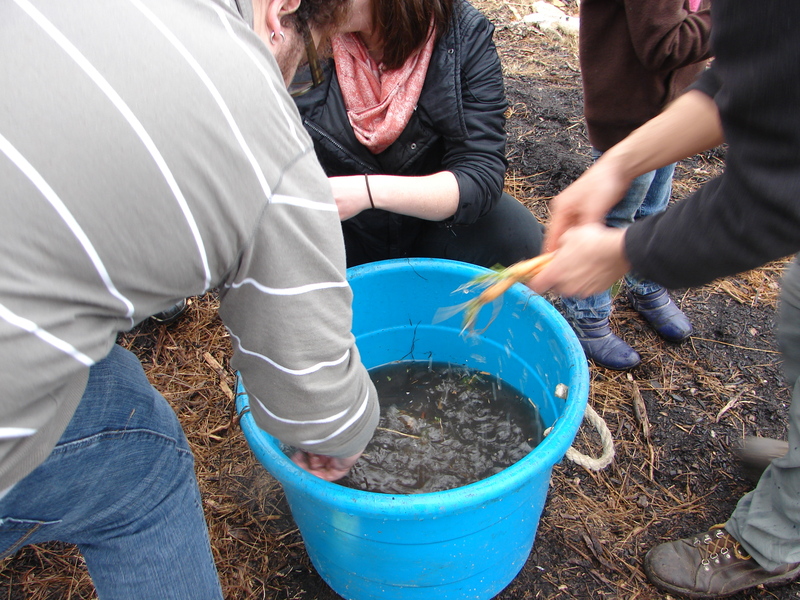 I probably can’t work the community garden or the lovely connections I made in this blog into my thesis defense, but boy, if I could! 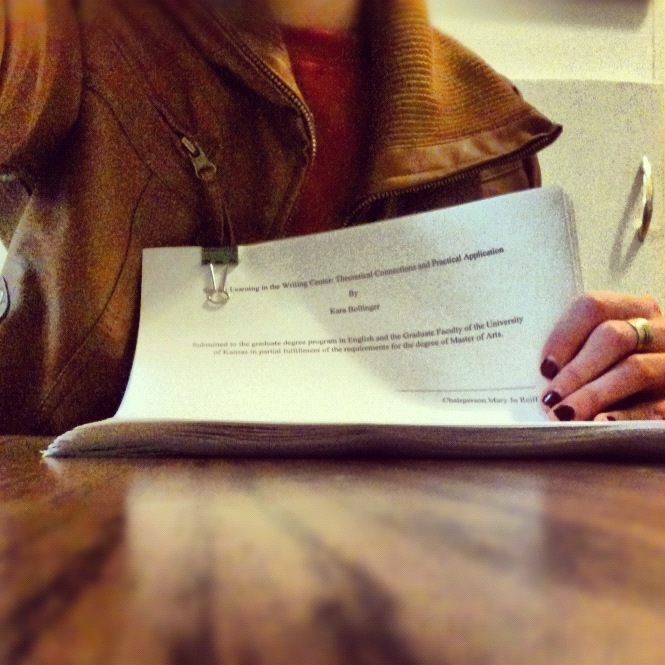 Thesis submitted Monday 3/19 around noon (an entire day early!). That’s a photo of 76 pages of composition/service learning/Writing Center creation. Because it’s sort of a big deal, I feel I should reflect…at least for a paragraph. Often, I’m not proud of academic writing, but I’m proud of this, which is nice. Honestly, finishing the whole thing was a little anti-climatic, though I’m sure it’ll sink in in a few days (ie when I wake up on a Tuesday morning and I don’t follow my typical thesis routine). A personal victory for sure. But that’s not the personal victory I want to talk about. I mostly told you because it means I have time to be outside and garden, and then tell you fine people about it. My longest-following, most loyal blog readers might remember this, but here’s a recap (or read this entry). 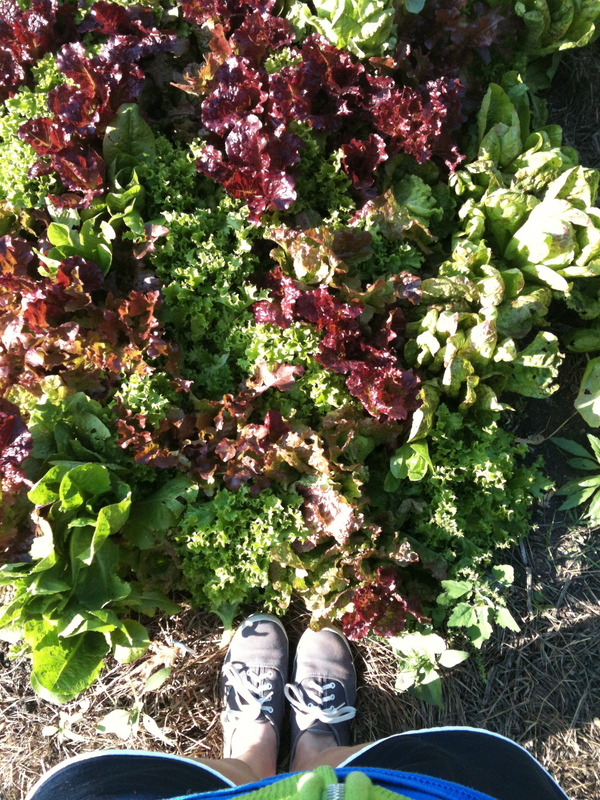 When I first started community gardening and this blog (almost two years ago!!! 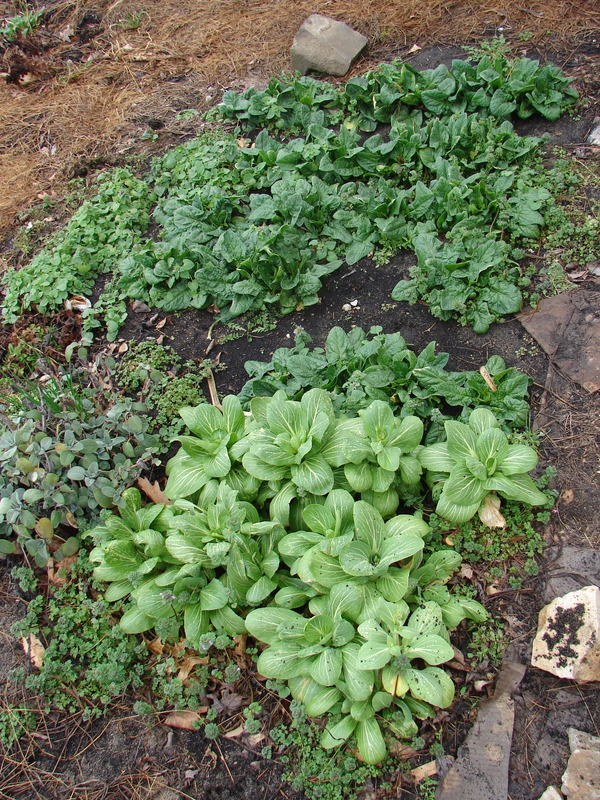 ), one corner was completely taken over by crabgrass and weeds and onions. I remember May 2010. It was rough. I had a big project I hated. I had also just broken up with a boy, though I didn’t tell you that then. I titled the blog “This is What Happens When I’ve Had It,” which older, smarter Kara finds hilariously awesome and appropriate. I rarely “have it” (and if I do, few people see it), but that week I did “have it.” And rather than “having it” at someone, I worked hard and pulled muscles in my back getting rid of many of those weeds. Well now, two years later, I’m even happier/prouder to report that after more work on Friday afternoon, those weeds are totally gone. Totally. This time, I wasn’t particularly stressed, nor had I “had it.” It was the first Friday of Spring Break and beautiful outside and even though the thesis wasn’t finished, I thought it a shame to spend the day writing at my kitchen table. I didn’t go to the garden intending to clean up weeds; I wanted to plant stuff. 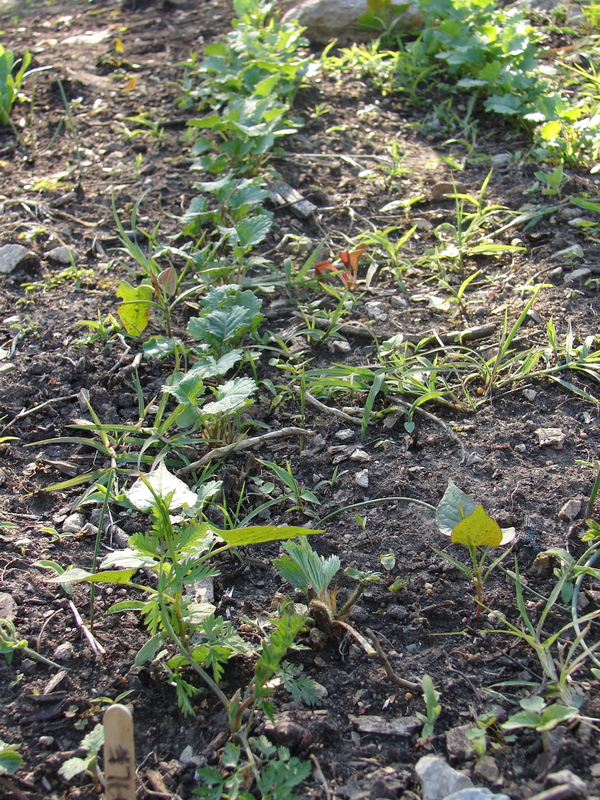 But, once I got there, starting totally clean/weed-free and using all the space in my plot made more sense than planting to the edge of the crabgrass. Most importantly, when I got there, I felt the surge of belonging I feel every time I step into that garden. Look at those feet/legs; they belong there. You take care of where you belong. 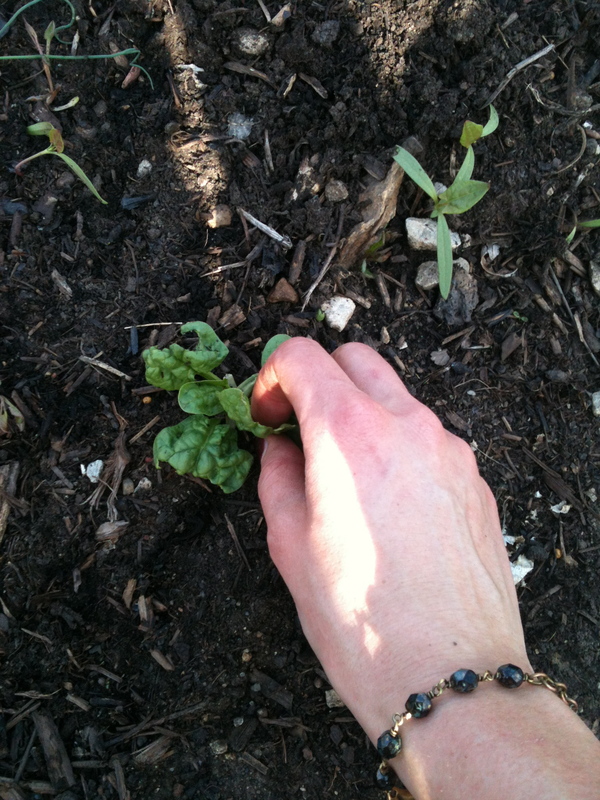 Then, I planted sweet potatoes, kale, spinach, and bok choi. I found a tiny sprout of spinach coming back. After I watered what I’d planted and accidentally sprayed my bike seat and bag, I picked some of the spinach that survived from last winter. I mentioned the spinach in the entry about carrots, but this was the first time I’d picked it since the fall. It is delicious and I have it for pretty much every meal. If you are in Lawrence, tell me you want spinach and I’ll do my best to make it happen. If you are not in Lawrence, I will send you spinach with my heart. That night, I felt the itchy-ness you get when you’ve been outside and gotten some sun. I saw straps on my feet after I’d taken off my sandals. It was great. Lawrence Bestie Mark said he could see the suntan on my face, too, though I doubt that’s true. A personal victory and an early start on a suntan? I’ll take it. It’s been raining steadily since Monday; those seeds have got to be a’germinatin’. I found this photo and HAD TO show you. In my last blog, I mentioned 7 year-old Noah, his requests for plastic snakes, bamboo wars, and Italian soda. Well, today on the community garden’s Facebook page, someone had linked this photo from the Lawrence garden tour last summer. Click on the link. That’s Noah showing off some of his plants, including that super successful cilantro he raised his hand to remind us of at the meeting. I thought it might be good for you to have a face to go with a name…plus it’s adorable. With garden friends as cute as this guy, how could you not love the community garden? 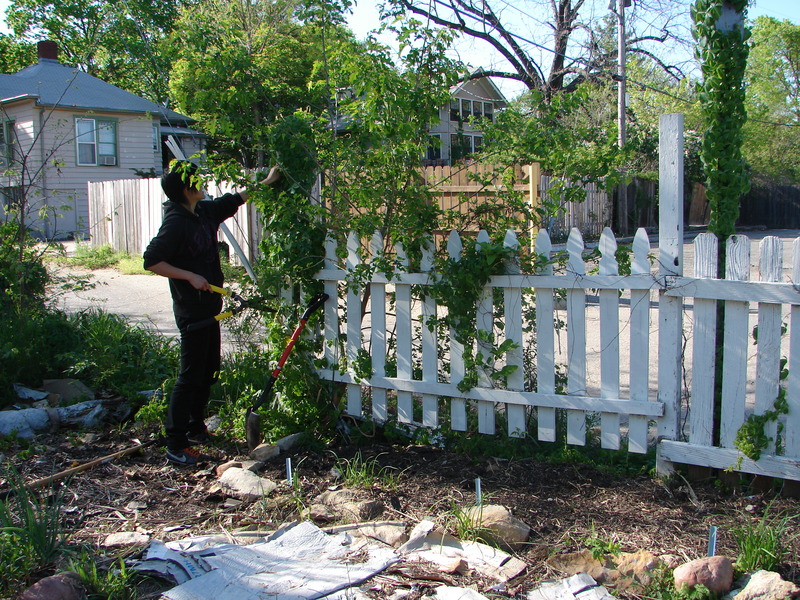 First community garden workday of the season today! I am writing immediately because I couldn’t wait to tell you. I’ve yet to plan out my garden plot with Clare. There are greens started in my windowsill and sweet potatoes that should most definitely go in sometime soon. Maybe tomorrow. Maybe last week. I turn in my Master’s thesis soon (9 days! ), though, so I’ve been a little preoccupied. Luckily, there are people in Lawrence that take cues from the weather and birds chirping. They remember that it’s time to think about planting. Even more luckily, those people are in my community garden. 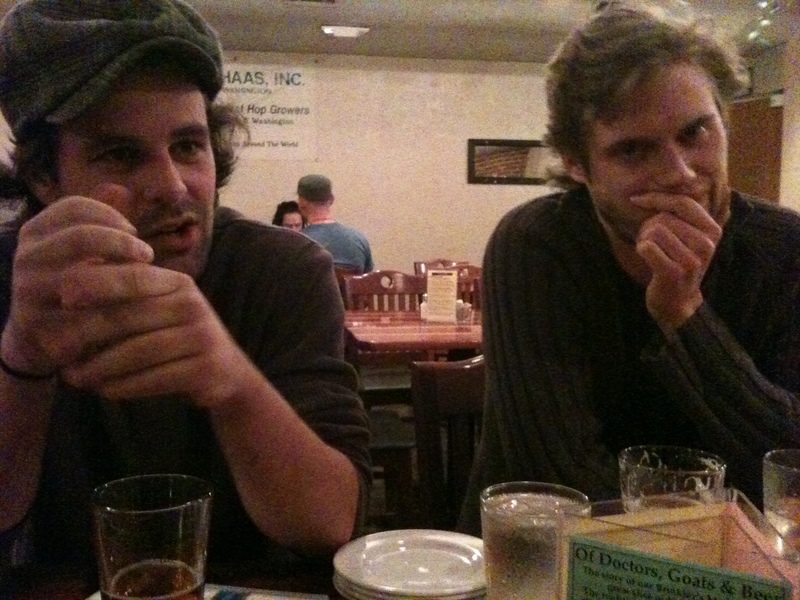 We returning gardeners met briefly last week to discuss this first workday. Thankfully our meetings aren’t serious meetings…we basically throw out random ideas and tell cool stories about the time we unloaded compost or when someone accidentally burned down the shed. 7 year-old friend Noah, a community garden favorite, was also there to pitch his ideas while slurping an Italian soda with whipped cream. He wants rubber snakes in the plots because they will keep the weird mouse things away. He also wanted us to remember that his cilantro grew really well last year and that the bamboo sticks make good weapons. He always raises his hand and waits to be called on before speaking, which I think is just all too great. He deserves his own paragraph. It rained all day today, and to be honest, I kept hoping for an email saying that our workday was cancelled. It never came, though, because we’re serious. I wasn’t sure what we’d do in the garden in the rain, but I rarely fail to do what’s expected of me. Plus, I knew it was important for someone to be there to meet the new gardeners. 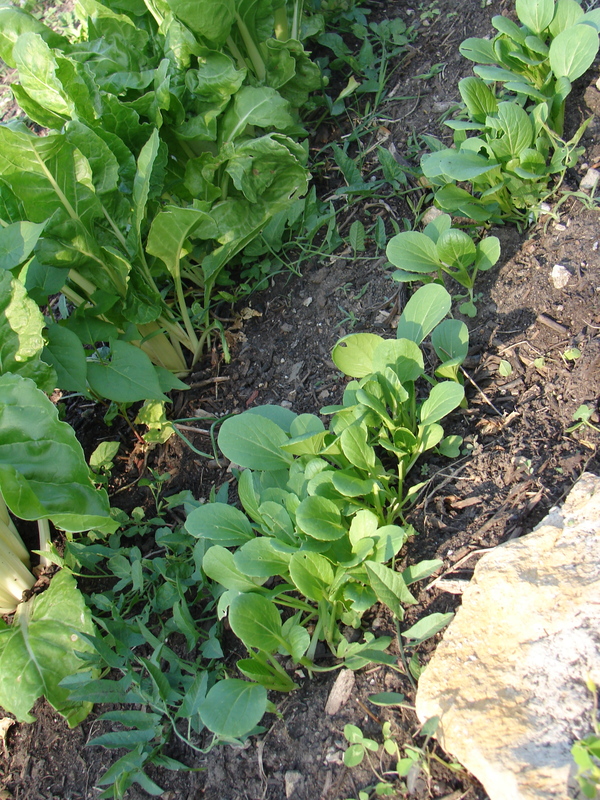 Admired the spinach and bok choi I planted in October and then ate in December and January that is still around. It is beautiful and tasty. Even though the summer will probably be super buggy, there are a few good things about ultra mild winters. Dug and washed carrots. Our fingers were cold. Ate carrots. This is Clare. Eating a carrot. 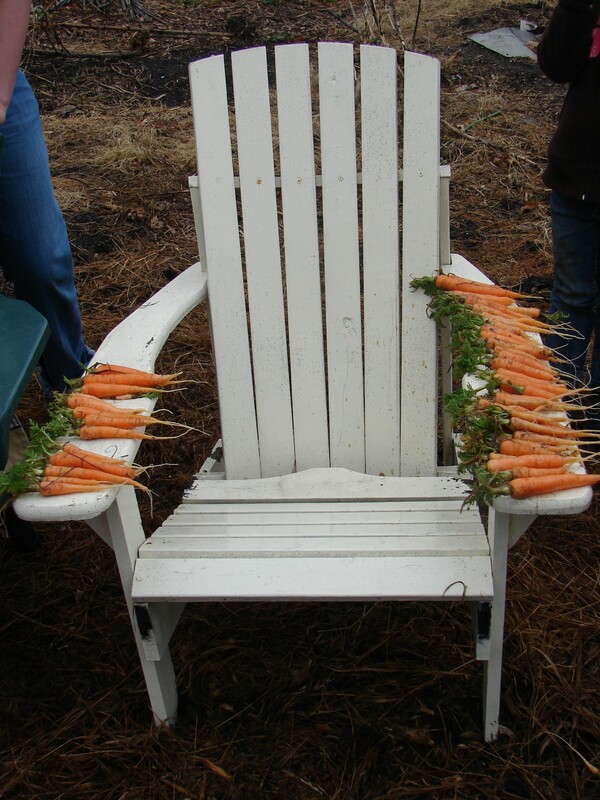 Posed carrots lovingly (and unevenly) on this chair for a photo. 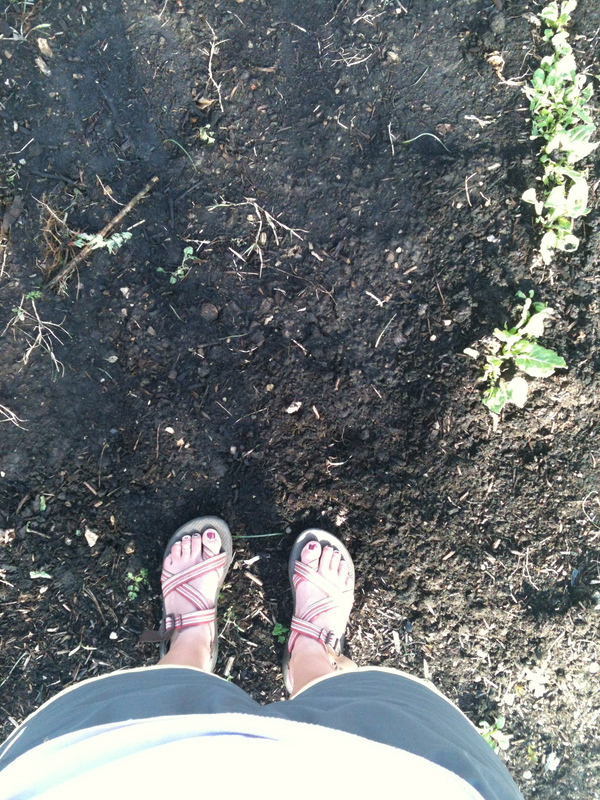 So, thus marks the start of my third year in the Lawrence Community Garden. I chose to avoid the phrase “my last year” in that previous sentence, but it’s also that. But, we’ll worry about July when July gets here. In 9 days, you will hear much much more about the garden. Expect big things. 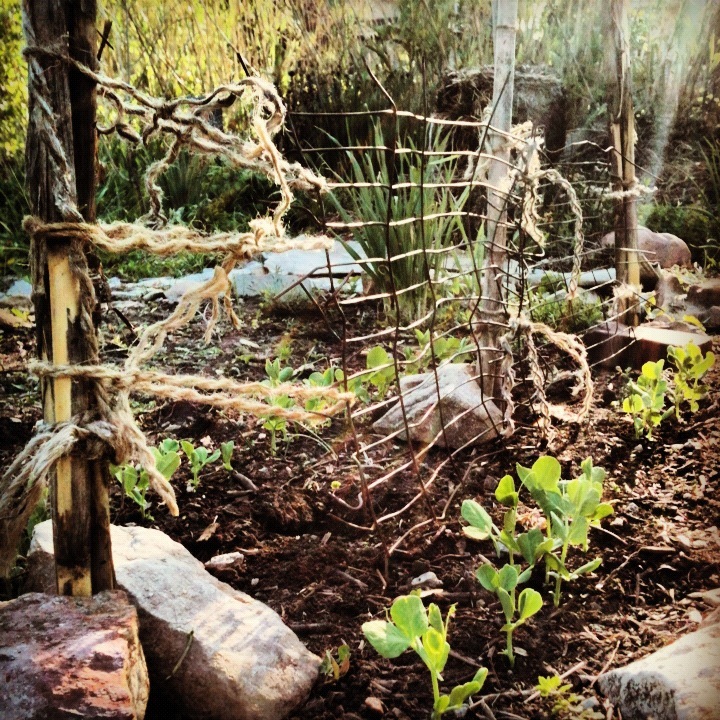 Taller pea trellises. Bigger sweet potatoes. Craftier defense against squirrels and slugs. Deeper blisters. More bamboo-sword fights with Noah. Harvests of greater than one green bean. Sprinkler parties. Sprinkler BIRTHDAY party (I just thought of that right now, but you’ve gotta admit it sounds awesome). Crossier cross pollination. Eggplant.